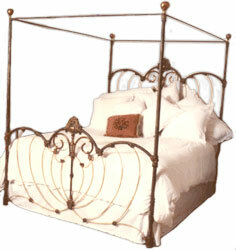 For over 30 years we at Antique Iron Beds by Cathouse have been refining the art of refinishing and adapting old original double size iron frame’s to accommodate today’s modern Queen and King size mattress’s.When converting an old antique iron double size we strive to maintain the symmetry and original design by adding only what is appropriate and necessary…..never redesigning. Only extending the original design. We believe if you are attracted to one of our iron frame’s in it’s original double size, the last thing we want is to alter what attracted you in the first place. It is our belief that had the iron bed factory, back in the 1800′s, offered Queen and King size’s they would have intended them to look as our antique iron bed conversions do today. We use the most sophisticated cutting, welding and bending techniques available. That along with a broad selection of over 200 casting molds enable us to give you a larger size to accommodate whatever size mattress you may have. Queen iron bed conversions on the other hand require only a length conversion to the side rails, do to the fact that the width difference from the antique iron bed double size is negligible. Any alteration we perform does not alter it’s antique classification or lessen it’s value. 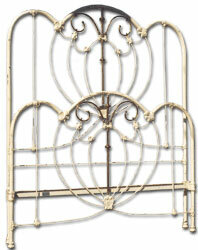 It is widely known that refinishing an antique iron bed frame, if properly done, will increase it’s value.